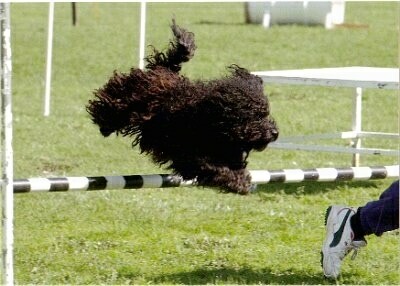 Miles the Puli performing agility, Aust. Champion Pasztor Voyage to the Stars A.D. E.T. J.D.X. H.I.T. S-NGC. O-NAC. S-NJC. S-OJC. Baby Boy the Puli—"Baby Boy has lots of names, actually; he is also called BooBoo, Booby, Poopoo Boy and Googy Shagy Boy, and he reacts to each of the names!" Baby Boy the Puli at 2 months old playing tug-of-war with his owner's pant leg!